Description: The Jøtul F 370 wood stove concept was designed by the renowned Norwegian design company Hareide Design. 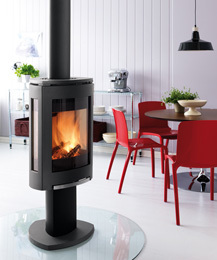 This wood stoves has innovative shapes and detailed cast iron. Large side windows give a fantastic view of the flames. The Jøtul F 370 Concept has received a number of prestigious design awards such as the German ”red dot design award: best of the best”, the Norwegian “Award for Design Excellence” and the US Vesta Award.